isn't she lovely? 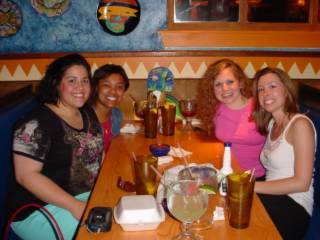 : the perks of grad school ... friends! the perks of grad school ... friends! the gang's breaking up, but boy were those margaritas good! This entry was posted on Thursday, May 11, 2006 and is filed under grad school , random thoughts . You can follow any responses to this entry through the RSS 2.0 feed. You can leave a response, or trackback from your own site.